Amperis introduces one of the industry’s highest performance revenue grade panel meters. Based on an all new platform, this low cost meter significantly outperforms other devices many times its price. This unit is perfect for new metering applications and as a simple replacement of existing analog meters. The Shark® meter excels in metering energy accurately, exceeding ANSI C12.20 (0.2%) and IEC 687 (0.2%) energy measurement standards. The unit utilizes high speed DSP technology with high resolution A/D conversion to provide revenue certifiable accuracy for Utility Billing, Substation Metering, Submetering and Critical Metering applications. Measurements including Voltage, Current, Power, Frequency, Energy, etc. The Shark® 100 meter is equipped with EIG’s exclusive V-Switch™ technology. This technology allows users to upgrade and add features as needed by using communication commands, even after the meter is installed. The Shark® 100 device is a traceable revenue meter. It contains a utility grade test pulse allowing power providers to verify and confirm that the meter is performing to its rated accuracy. This is an essential feature required of all billing grade meters. The Shark® 100 meter provides two independent communication ports with advanced features. RS485 (Option 485P) – This port allows RS485 communication using Modbus or DNP 3.0 Protocols. Baud rates are from 9600 to 57.6k. Ethernet (Option INP10) – 10/100BaseT Ethernet with Modbus TCP protocol. Note: Typical results are more accurate. Applies to 3 Element WYE and 2 Element Delta Connections. Add 0.1% of Full Scale plus 1 digit to Accuracy specs for 2.5 Element connections. Uniquely, the Shark® meter also has an optical IrDA port, allowing the unit to be set up and programmed using a remote laptop PC without need for a communication cable. To configure the meter, just point at it with an IrDA-equipped PC. The Shark® 100 meter is ruggedly designed for harsh electrical applications in both high voltage and low voltage power systems. This is especially important in Power Generation, Utility Substation and Critical User applications. The structural and electrical design of this meter was developed based on the recommendations and approval of many of our utility customers. 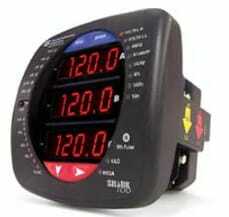 Voltage inputs allow measurement of up to 416 Volts Line to Neutral and 721 Volts Line to Line. This insures proper meter safety when wiring directly to high voltage systems. One unit will perform to specification on 69 Volt, 120 Volt, 230 Volt, 277 Volt and 347 Volt power systems. Method One – CT Lead Pass Through. The CT Lead passes directly through the meter without any physical termination on the meter. This insures that the meter cannot be a point of failure on the CT circuit. This is preferable to utility users when sharing relay class CTs. No Burden is added to the secondary CT circuit. Method Two – Current "Gills." This unit additionally provides ultrarugged termination pass-through bars, allowing the CT leads to be terminated on the meter. The Shark® meter's stud-based design insures that your CTs will not open in a fault condition. From user interface to mechanical construction, the Shark® 100 Meter was designed to be easy and intuitive, so an installer with minimal meter experience and training can easily install and use this product. The unit mounts directly in an ANSI C39.1 (4" round form) or an IEC 92mm DIN square form. This is perfect for new installations and for existing panels. In new installations, simply use DIN or ANSI punches.